[Ezra] Vogel ends his new account of the Paramount Leader [Deng Xiaoping] by asking: ‘Did any other leader in the 20th century do more to improve the lives of so many? Did any other 20th-century leader have such a large and lasting influence on world history?’ Deng Xiaoping and the Transformation of China is an exercise in unabashed adulation, sprinkled with a few pro forma qualifications for domestic effect. ‘The closest I ever came to Deng was a few feet away at a reception -‘ captures the general tone. Fortunately, Deng’s family and friends were able to make good the missing encounter, with many a gracious interview illuminating the patriarch’s life. Supplemented by much official – properly respectful – documentation from the Party, and a host of conversations with bureaucrats on both sides of the Pacific, the outcome is a special kind of apologia, where the standard of merit is less Deng’s record as a politician in China than his contribution to peace of mind in America. Deng threw 11 Chinese armies or 450,000 troops, the size of the force that routed the US on the Yalu in 1950, against Vietnam, a country with a population a twentieth that of China. As the chief military historian of the campaign, Edward O’Dowd, has noted, ‘in the Korean War a similar-sized PLA force had moved further in 24 hours against a larger defending force than it moved in two weeks against fewer Vietnamese.’ So disastrous was the Chinese performance that all Deng’s wartime pep talks were expunged from his collected works, the commander of the air force excised any reference to the campaign from his memoirs, and it became effectively a taboo topic thereafter. Politically, as an attempt to force Vietnam out of Cambodia and restore Pol Pot to power, it was a complete failure. Deng, who regretted not having persisted with his onslaught on Vietnam, despite the thrashing his troops had endured, tried to save face by funnelling arms to Pol Pot through successive Thai military dictators. Hysteria, calculation or a mixture of the two, Deng’s motives at the time are one thing. Endorsement of the claims he pressed on his interlocutors – South-East Asian and American – to justify his aggression, in works supposedly of scholarship thirty years after the event, are another. [Henry] Kissinger, for whom the history of the period is little more than a grab-bag for his own self-glorification as an actor in it, can be forgiven for maintaining that China’s war on Vietnam was a vital blow against the Soviet Union and a stepping-stone to victory in the Cold War. That the Sino-American alliance he negotiated, and Deng escalated, had scant bearing on the dissolution of the USSR hardly matters. Whatever his other gifts, truth is not one that can reasonably be expected of him. 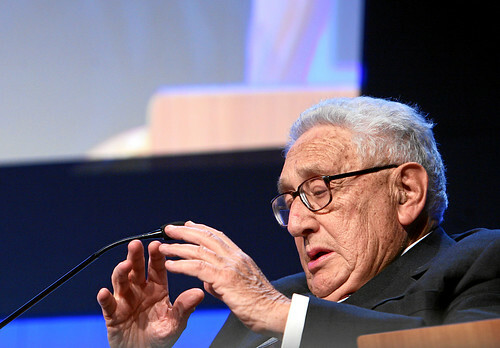 Kissinger’s description of [U.S. President Jimmy] Carter’s actions in assisting the perpetrators of one of the few true genocides of the last half-century – not killings on a far smaller scale, blown up as genocide to decorate ‘humanitarian intervention’ in Kosovo, Iraq, Libya or elsewhere – can stand for Vogel’s treatment: informal collusion, in academic dress. Deng, a far more uneven, explosive and complex figure, at once more radical and more traditional than the now standard images of him, awaits his biographer. That book will not be written as another page in US self-satisfaction. The historical reality was that no outstanding leaders emerged from the confused morass of the [Kuomintang] KMT in the Republican period. The contrast between Nationalists and Communists was not just ideological. It was one of sheer talent. The CCP produced not simply one leader of remarkable gifts, but an entire, formidable cohort, of which Deng was one among several. By comparison, the KMT was a kingdom of the blind. Chiang’s one eye was a function of two accidental advantages. The first was his regimental training in Japan, which made him the only younger associate of Sun Yat-sen with a military background, and so at the Whampoa Academy commanding at the start of his career means of violence that his rivals in Guangzhou lacked. The second, and more important, was his regional background. Coming from the hinterland of Ningbo, with whose accent he always spoke, his political roots were in the ganglands of nearby Shanghai, with its large community of Ningbo merchants. It was this base in Shanghai and Zhejiang, and the surrounding Yangtze delta region, where he cultivated connections in both criminal and business worlds, in what was by far the richest and most industrialised zone in China, that gave him his edge over his peers.